Every now and then I hear something that causes me to sit up straight and say, “Holy [expletive I shouldn’t use]. That’s a line.” (And yes, I mean that in a good way.) Most recently, that was my response while listening to songs off Americana trio American Longspurs‘ new release Palo Santo. Although relatively young, the Phoenix-based band consisting of Chester Carmer, Drew Switzer, and Zachary Zimmerman (who are joined by John Churchill and Nick Pawlowski on the EP and on stage), should look at this album release with pride. 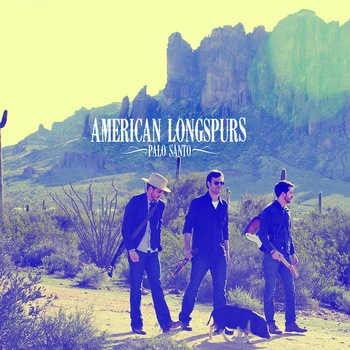 American Longspurs meld elements of traditional country with rock in a manner that never feels disjointed. While many artists seem to pay lip service to respecting classic country music, that’s not always evident in their sound. Fortunately, that’s not the case with American Longspurs. Frequently plainspoken, sometimes poetic, Palo Santo provides a soundtrack for wanderers. Awash in winding steel guitar, sprawling fiddle, and pulsating electric guitar, Palo Santo is a rambler’s record. It may not be the most polished recording listeners will hear this year, but it channels a raw energy that reflects the restless nature of the songs’ narrators. Zimmerman’s gravelly vocals ground the tunes, evoking a tone that’s conversational and confessional. Conjuring up images of small towns, wide open spaces and dusty highways, anyone who’s ever dreamed of taking off into the night should be able to relate to Palo Santo. The EP showcases the chasms between the past and the present, men and women, and expectations and reality. The songs progress from initially carefree to darkly contemplative as the narrators frequently seek both physical and emotional distance from their problems. Above all, Palo Santo revolves around intimate relationships (both with people and landscapes) and the potential consequences related to those associations. Not coincidentally, “Love Song,” a direct, steel guitar-drenched remembrance, resides at the center of Palo Santo. The song bridges the gap between longing for one’s youth and struggling with adult uncertainties. It also provides the EP’s heart, expressing both admiration for the narrator’s family and roots and appreciation for his current companions who join him on the road. Tellingly, Zimmerman sings of a melancholy that wears on his heart, but ultimately aids his songwriting: “I get sad/ More days than I don’t/I was born like that,” he acknowledges matter-of-factly. Encompassing feelings of pride and apprehension, “Love Song” is alternately healing and heartbreaking. While “Love Song” is a core track, “The Good Fight” might emerge as the EP’s biggest highlight. The ballad features some of Palo Santo‘s most arresting imagery, with the narrator pocketing mementos that “[he] kept from the places/that [he] ain’t been to yet.” (Hence my earlier expletive.) Waves of graceful steel, mandolin, and fiddle carry the reflective number to new heights, ably representing the beautiful unpredictability of the journey the narrator is about to undertake. The audience is ultimately left questioning whether the narrators of the songs on Palo Santo are running from or toward something. Much like in real-life, there’s no definitive conclusion. However, riding shotgun with American Longspurs throughout the songs on Palo Santo should provide listeners with an experience that ‘s sometimes bumpy, occasionally smooth, but ultimately exhilarating.